In my recent post on reading theoretical work, I gave two sentence summaries of complex work from Foucault and Butler, among others. I had cause to reflect on this decision recently while reading Michelle Boulous Walker’s Slow Philosophy: Reading against the institution. How wonderful to read like this! 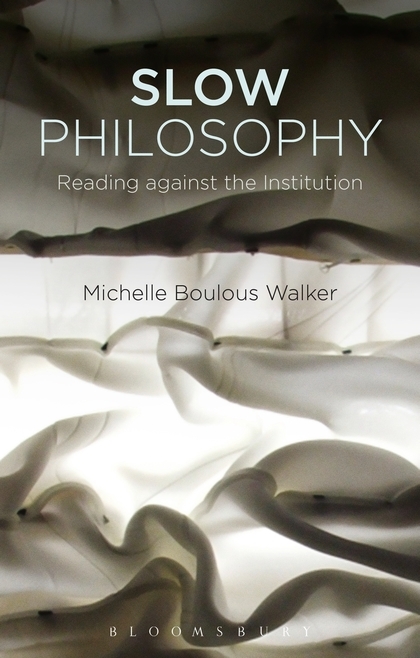 Boulous Walker contrasts slow reading with “institutional reading”—that is, the sort of reading that dominates in the university context. You are probably well practiced in institutional reading—hasty, shallow, in judgement, for information extraction, to simplify, while distracted, while exhausted, reading abstracts only, relying on the reading of others, skimming. In my post, did I perform an institutional reading? In some ways, yes—I’ve learnt my academic lessons well. I have prided myself on being able to read and summarise work quickly and to make notes that minimise the need to reread. In my defence, I have been reading (and rereading) the work of Foucault, Butler and their ilk since I was an undergraduate student over twenty years ago. My intention in that post was to open up the ways in which we can “do things” with theory. It is a starting point only—an entry into rereading, asking questions, thinking more deeply, and a chance to collaboratively explore what reading makes it possible to think. Black, Crimmins and Henderson’s (2017) Positioning ourselves in our academic lives: Exploring personal/professional identities, voice and agency. and Handsforth and Taylor (2016) Doing academic writing differently: A feminist bricolage. In both papers, the authors are explicit about the task of finding ways to write around and beyond the constrictions of academic research outputs. Handforth and Taylor’s (2016) work marks a “refusal” to be bound by restrictive quality indicators and performance measures (“what star rating is your article?”) and a “destabilis[ing] of academic writing” (p 628). Similarly, Black et al. (2017) perform the task of “interrupt[ing] and challeng[ing] the norms of writing for/in academia” by “breaking open existing ‘boundaries of academic language’ (p 2). We began to write differently in our academic spaces. We found ourselves engaging with research as friendship and belonging through writing as research. Our personal storytelling and aesthetic modes of representing experiences started nudging open academic and educational spaces (2017, p 5). This article is not (has not been) an easy text to write but it has been fun. The moments of effervescence when they delight of finding the right word/ phrase/ quote filled us both with an infectious joy as we sat at the computer together pounding out the sentences in my (Carol’s) hot office (p 638). These meta-writing strategies make for layered, complex and ‘messy’ experiences which reward slow reading and rereading.